Mac Text SMS Software (Multi-Device Edition) facilitates users by sending bulk number of text messages without using any internet connection. Global text sms software provides facility to send sms on all national or international mobile networks. ➮ Provides facility to load contact number from phone book for bulk text messaging. 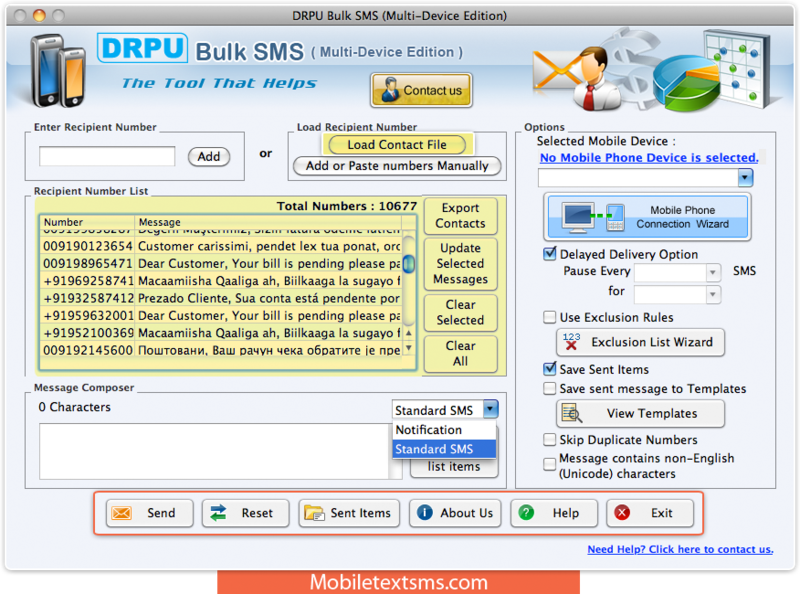 ➮ Bulk SMS software provides facility to skip duplicate contact numbers for sending unlimited text messages. ➮ Send notification and standard messages to your clients and customers. ➮ Easily saves sent messages as templates that can be viewed later by user. Helps in growing business sales and revenue. Provides reliable way to communicate with your global mobile audience by sending bulk SMS. Software does not require any internet connection to send bulk text messages. Supports multiple number of GSM technology based mobile phones.